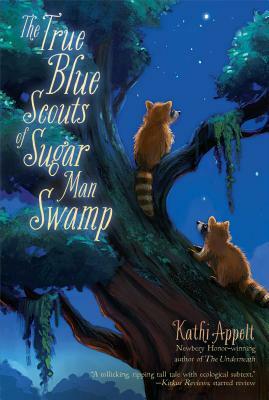 Meet Bingo and J'miah, raccoon brothers on a mission to save Sugar Man Swamp in this tale from Newbery Honoree Kathi Appelt. Raccoon brothers Bingo and J'miah are the newest recruits of the Official Sugar Man Swamp Scouts. The opportunity to serve the Sugar Man -- the massive creature who delights in delicious sugar cane and magnanimously rules over the swamp -- is an honor, and also a big responsibility, since the rest of the swamp critters rely heavily on the intel of these hardworking Scouts. Twelve-year-old Chap Brayburn is not a member of any such organization. But he loves the swamp something fierce, and he'll do anything to help protect it. And help is surely needed, because world-class alligator wrestler Jaeger Stitch wants to turn Sugar Man swamp into an Alligator World Wrestling Arena and Theme Park, and the troubles don't end there. There is also a gang of wild feral hogs on the march, headed straight toward them all.